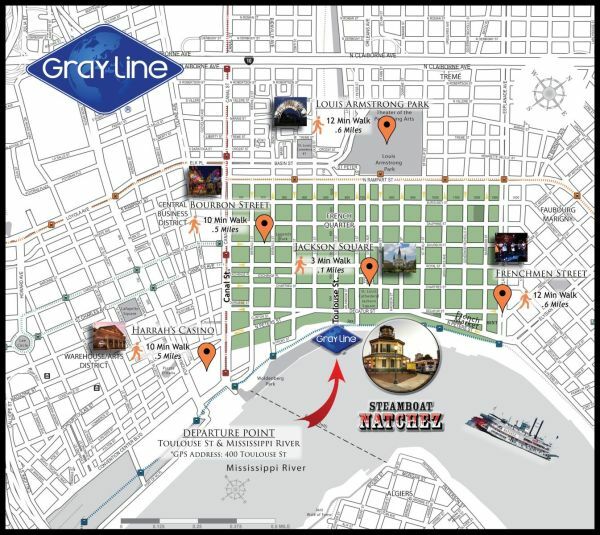 All tours begin and end at the Gray Line “Lighthouse” ticket office at Toulouse St. and the Mississippi River (at the Steamboat Natchez Dock), just one block from Jackson Square in the French Quarter. We are located at 400 Toulouse St. (on Google Maps). Please arrive at the departure location at least 15 minutes prior to the tour departure time. The Gray Line Lighthouse is centrally located and a short walk from many of the area’s most popular hotels and visitor hot spots. With the narrow historic roads of the French Quarter, walking is usually not only the quickest route but certainly has the least impact on our environment. The New Orleans streetcar system will drop you right at our front door. The interconnecting system weaves its way throughout the city via the historic St. Charles Streetcar to the mid-century modern Riverfront Streetcar. Follow link below for routes and maps. The Gray Line Lighthouse is conveniently located around a variety of parking lot options. These lots offer hourly rates and are managed by Premium Parking. The nearest Lots are P401, P405 & P402 & P404. Please see link below for more information.